It is a relatively easy process to turn a photo into a line drawing with photoshop. Follow the steps below which uses layers, image desauration, layer modes and a guassian blur to change a photo into a pencil sketch. This effect will work on almost any image. The final quality will depend on how sharp your original image is. If there are lots of strong lines in the original image, then this process is the one for you. Use the quick key commands at the bottom of the post to change any image into a line drawing in under a minute! Open up the photo that you wish to change into a drawing. I have used this Coke can photograph by Cyclonebill. It can be found on WikiMedia Commons if you wish to use the same image to follow this tutorial. Duplicate the image in the layers pallette. With the new layer selected you need to desaturate the image. To do this go to Image > adjustments > desaturate. Or choose Shift Apple U / Shift Ctrl U. Duplicate this modified layer. You should now have a colour background layer and 2 desaturated layers above. Select the top layer and invert the image. To do this go to Image > Adjustments and choose Invert or press Ctrl I / Apple I. We now need to apply a guassian blur to the newly white layer to allow parts of the layer underneath to show through. Select the top layer and choose Filter > Blur > Guassian Blur. Move the slider up and down to find what level suits your picture. The setting for this is often somewhere between 1 and 3 but will depend on how complex your original image is. To tidy up the image use the Dodge and Burn tools to clean up the image. 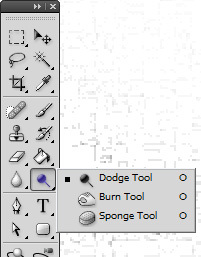 The Dodge tool will lighten the pencil marks, the burn tool darken them. I am going to use the dodge tool on the Coke can image to tidy up the background around the can. Mac: With the original picture selected in the layers palette; Apple J, Apple Shift U, Apple J, Apple I, with the top layer selcted choose ‘colour dodge’, Guassian Blur setting between 1 & 3. PC: With the original picture selected in the layers palette; Ctrl J, Ctrl Shift U, Ctrl J, Ctrl I, with the top layer selcted choose ‘colour dodge’, Guassian Blur setting between 1 & 3. Thank you so much. I am trying to laser etch an image into stainless steel and it must be an outline. You just saved me so much time. Your a life saver!! Is this adobe ps? Hi Jill, if there isn’t a lot of contrast in your original picture, it may be that you need to set the Guassian Blur to a higher setting than 1.5, so you could try that. It is also important that you duplicate the layers in the early stages and have the different layers underneath as the top layer actually masks the layer behind it to create the picture, so also check that you have the correct sequence of layers in the layers palette before adding the guassian blur on the top layer. I hope that that helps. oh wow this was so easy to do following your quick key command steps. Thanks so much! Hi there! I love this post!! I can’t wait to give this a try!!! I hope you don’t mind, but I have included this tutorial in a blog post: Top 10 photoshop tutorials, on my blog, “Cookies with Cronkite.” I have included a link to this post, a picture and a link to your blog homepage. Check it out.. please leave comments, I would LOVE your feed back!! Hi Liz, the tutorial was written for regular Photoshop, but please try the steps in Elements and let us know how you get on. If anyone else has tried this in elements please let us know. It was very easy, thank you very much. This is fabulous! Now if I want to copy a portion of the original photo, do I need to flatten the layers? I’m using Photoshop Elements 8 and Step 6, “color dodge” doesn’t make my image mostly white, it does, however, invert the tones so what was once dark is now light and vice versa. The gaussian blur also does nothing but blur the color-dodged image. Any help for Elements 8 here? If anyone uses Photoshop Elements and can help with the questions please use the comments below. Just tried this in Elements 9 and it worked perfectly. Not sure why PE8 doesn’t work. Hi Arome, Thanks for your comment. Let me know in the comments if there is anything in particular you would like a tutorial about. Thanks. Brilliant! Thanks for helping, I am a beginner too, used this on a pretty complex photo, had to ramp up the blur but I love it! Thanks so much. Made my life easier. The best step-by-step Photoshop instruction I have ever used – thank you so much. I’m using PS Elements 8. I’m trying to make a photo of a building look like a drawing. The result I have does not look like a pencil drawing at all. Rather it looks like a photo with color and some shadows removed. Increasing the Blur makes it look like a more grayscale picture. Is it me or the software? Never used photoshop before and I managed it. All apart from the dodge and burn tools as Im using laptop with limited mouse manoeuvrability. Great hannah, though there are a few online photo conversions to sketch available, they never have the full image conversion, meaning the image result that they give is of either much less image size or does not give the required effect. Any body seeking to do the ‘pencil work’ manually, just follow hannah’s guidance. Hannah, what an amazing job. You’ve put this challenging task into simple steps that defines “user friendly” to a different level. Your awesome for your techniques you’ve created in teaching the rest of us. You are the “instructor” in this categor. Which of the several versions of Photoshop has this feature? I do not want to buy a program, install it, and find I need something else. Hi Jeff, I can’t see any reason why this wouldn’t work in all main CS versions of Photoshop as all have layers, filters and layer properties used in the tutorial. You can always download a free Photoshop trial to test it in the version you are thinking of buying. (It won’t work in Photoshop lightroom). Tutorial is good. But the image doesn’t looks like pencil sketch effect. Hope to see such more wonderful tutorials. It was a great experience! Loved doing it. Will appreciate such more tutorials. Pl provide links. It will certainly help me add value to our mag. Thanks alot hannah. Amazing tutorial. Very easy to follow the steps. U r rocking…. Brilliant – just what I needed. Thanks for the tips. I just made a fabulous line drawing from a photo of my house! Thank you, this was a great help!! Thanks for your great tutorial. I am a first time user of Photoshop, I never had any contact with it until 2 hours ago and had to do a vector drawing turned out pretty good with practice I am sure I will get better.. one photo had a lot of reflection on glass and when I inverted it it didn’t all turn white and of course you could still make out the person who took the photo. is there a way of getting rid or lessening it? I’m using the following editor https://pixlr.com/editor/ think it is photo shop 8 everthing worked until photo dodge and I can’t find where to find photo dodge. Step 6 I mean about photo dodge hannah can you look and find it for me please…. Very helpful. I will be exploring the site for more PS help and tricks. tnx…. i have done it..
Do you at some point recombine the layers? I have seen similar directions that had me merge down at some point. Excellent tutorial. Thanks very much! Just the tutorial I needed – thank you! This is fantastic! I’d been trying to get good results for days before stumbling across this tutorial. 2 minutes and it’s all done. Really great tutorial Hannah, thank you! could you make a tutorial like this only with gifs? This is brilliant! Thank you so much. I’ve really been struggling! Now I have exactly the ‘drawing’ that I want – and it only took me a couple of minutes. Thanks hannah! Great job explaining – it was pretty easy even for an inexperienced user (love PS but just don’t dedicate the time to it). How do I save the edited picture itself as a image in my computer? You can save the image as it is as a layered .psd file. Or you can choose to flatten the image into 1 layer and save as a .jpg. Hope that helps.